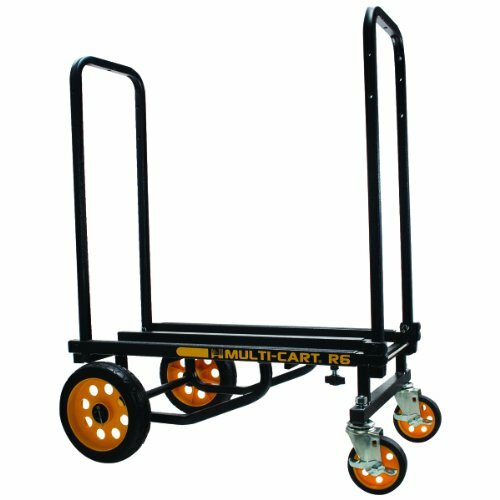 This versatile, multi-use cart has the ability to unfold into eight different configurations and has a 500 lb. cargo capacity. Cut moving time and effort by 50%. The compacted size is: 28.25" L x 17.25" W x 9.75" H and the expanded size is: 42.5" L x 17.25" W x 33.25" H. The rear wheels are 8" R-Trac no flat wheels and the front wheels are 4" swivel casters with brake. R-Trac wheels provide a cushioned ride and low rolling resistance. Can be made into: Short or long furniture dolly, Two-wheel hand truck, Storage/transport device, Short or long platform cart, and Short or long hi-stacker. Advantus Corp. is dedicated to providing innovative quality products at fair prices. If you have any questions about this product by Advantus, contact us by completing and submitting the form below. If you are looking for a specif part number, please include it with your message. New Black Metal Finish Rolling Microwave Cart with Power Strip!